Wayne Rehberger, chief financial officer at Engility, has won the Virginia Business magazine’s CFO award in the publicly traded companies category in recognition of his dedication to financial stewardship. The magazine announced the recipients of this year’s Virginia CFO awards during the 12th annual awards gala held Thursday at Jefferson Hotel in Richmond, Virginia, Engility said Monday. “Wayne is a first-class CFO with strong ethical standards and financial acumen, and it is gratifying to see him receive the recognition he deserves,” Engility CEO Lynn Dugle said. Rehberger, former SVP and CFO at TASC, assumed similar roles at Engility in 2015 after the Chantilly, Virginia-based technical services company completed the $1.1 billion acquisition of TASC. 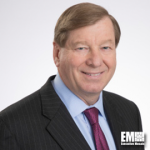 He is a U.S. Army veteran who held senior leadership roles at XO Communications, MCI Communications and KPMG.